To Cite: Ansari O, Zarezade M, Saberi Kakhaki A. Effect of Distance Increase of External Focus of Attention on Tracking Task Learning Under Secondary Task Condition, Int J Sport Stud Hlth. 2018 ; 1(2):e82043. doi: 10.5812/intjssh.82043. Objectives: Numerous studies have demonstrated that using an external focus of attention significantly enhances motor skill performance. However, limited research has been carried out on increasing the distance of an external focus of attention. Therefore, the main purpose of the present study is to determine whether learning tracking task is affected by different attentional focuses. Methods: A sample of 42 participants, after taking a pre-test, were divided randomly into three groups, including distal external group (DEG), proximal external group (PEG), and control group (COG). Proximal external focus group received instructions concerning near body movements; distal external focus group received instructions on the effect of movements in the environment, and control group did not receive any instructions. The participants practiced the tracking task in four blocks of four trials under their own condition of attention. Then, after 48 hours, they participated in a delay retention test under secondary task condition (auditory). Results: The results indicated that distal external focus group learned the tracking task better than proximal external focus group (P > 0.05), however, control group learned the tracking task less effectively than the other groups. Conclusions: These findings suggest that increasing the distance of an external focus of attention improves tracking task learning, especially under secondary task, because secondary task condition enhances attention resources and shifts focus of attention to the external environment. In the recent years, coaches and trainers use instructions for learning and teaching motor skills. The most important instructions are attentional instructions which direct the attention of learners to different aspects of movement. Wulf et al. (1-3) demonstrated that directing learners at focusing on the effects of their movements, i.e. an ‘external’ focus of attention, results in further learning benefits than directing learner at focusing on their body movements, i.e. ‘internal’ focus of attention. According to Constrained Action Hypothesis, in efforts for conscious control of movements, i.e. internal attention, the motor system will be limited and will prevent automatic processes that control movement better (3, 4). Clear advantages of an external focus have also been found in other studies regarding, for instance, learning basketball and/or vertical jumping (5, 6). It has been shown that distal external focus (focusing on a farther effect) is more effective in skills with more than one effect of movement, (7-9). Duke (2011) studied the effects of a different focus of attention on performing a simple keyboard passage (10). In this regard, 16 music experts performed a brief keyboard passage under each of four focus conditions (their fingers, the piano keys, the piano hammers, and the sound produced). The results showed that with focus on the effects of the movements produced, performance was more accurate and smoother rather than on the body movements, and more distal focus of attention resulted in enhanced accuracy in the motor control. Conclusively, it was shown that, an increased distance of the external focus from the body was resulted in better performance of a skill. Thus, consistent with the self-invoking trigger hypothesis, physical or psychological distance from the body or self-scheme may be a key factor responsible for the external focus benefits (11). Furthermore, a farther focus may actuate the general motor pattern to obtain a general purpose. Therefore, distal attentional focus draws out a more general and more effective motor pattern, and closer focus may result in more attention paid to the action details. Retention test is usually used to assess the learning process. It seems that in attentional studies, we cannot be certain whether or not the participants will pursue the same attentional focus of acquisition phase as in a retention test. Therefore, it is better to use retention tests under secondary task condition in order to cause distraction for participants and prevent them from pursuing the attentional focus of acquisition phase (12). Secondary task condition refers to the condition in which participants must answer to more than one stimulus simultaneously. So, the present study used secondary task condition on a retention test in order to cause distraction and apply attentional capacity dimension. Nevertheless, despite the ambiguity of distance effect, the present study attempts to clarify whether or not using distal external focus results in better performance. In addition, this study can incorporate attentional capacity dimension by adding attention load dimension through secondary task and can help the expansion of knowledge in this context. Forty-two male students (20.32 ± 2.09 year) participated in this experiment. All subjects signed the consent form before begriming of experiment. All participants were in good health in terms of hearing, sight, and motion. Research ethics committees of Kerman University of Medical Sciences assessed and approved the experimental protocol. (Ethical Approval Code: IR.KMU.REC.1395.353). Two-hand coordination test of Vienna set (test form S2), was used in the present study as the tracking task. Test form S2 consists of four runs. The starting point is located on the right. The track is 12 pixels wide and the tolerance range is 16 pixels. 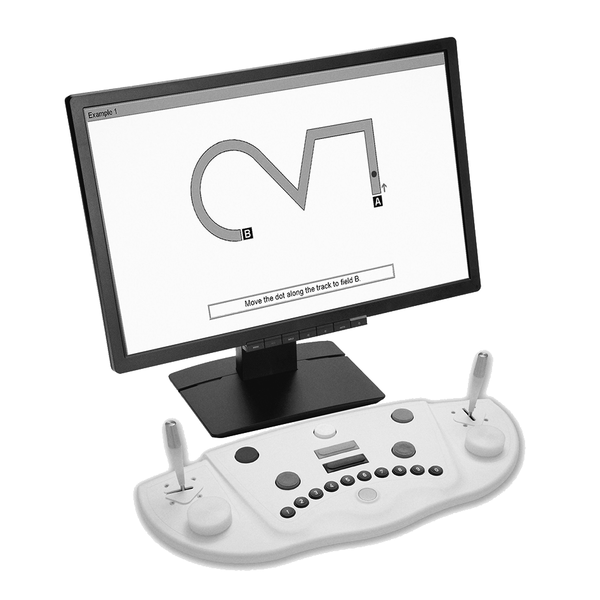 Horizontal movements are controlled by the left joystick and vertical movements by the right one. Participants must move red dot along a track shown on screen (Figure 1). In the practice phase, two runs are presented. An acoustic feedback signal is made in case of an error. Internal consistency (Cronbach’s Alpha) of the test lies between r = 0.85 and r = 0.97. The content validity of the test is given as logical validity. “Karner and Neuwirth (2000) showed that performance in the two-hand correlates significantly (r = 0.50) with an assessment of the driving ability. These authors also found that individuals with a score of PR < 33 received a significantly worse assessment of their performance in a standardized driving test” (13). Figure 1. Copyright ©SCHUHFRIED - A. C. Schiffleitner, Manual of Vienna test system. Reprinted with permission. The device together with the related software, designed by the researchers, was used to apply secondary task condition. The secondary task set consisted of a pedal and a steering box connected to the laptop via a USB cable. The pedal was placed under the participants' feet. Participants were required to press the pedal as soon as they heard a continuous toot. Stimulus appearance distance was set randomly between 5 - 10 seconds (14). Consistency of this set was estimated in a test-retest (P = 0.09). All participants completed a pretest of two-hand coordination (test form S2), then they were assigned to 3 homogeneous groups including 14 subjects in each group. All participants were provided with a one-minute interval between the pretest and the main test. Acquisition phase included 4 blocks of 4 trials. The blocks were one minute apart. During this time and the period of the test itself, the researcher also asked the participants to focus on their own attentional condition. The researcher asked the proximal external group (PEG) to focus on the joystick movements (up, down, right, left). Distal external group (DEG) received instructions about red dot movement in different sections of the track (For example, on first section, focus on arriving red dot at end of vertical section), while control group (COG) did not receive any instructions. In the retention phase (after 48 hours), the participants completed 1 block of a two hand coordination test under secondary task condition. In the retention phase, participants did not receive any attentional instructions, and the toot of the auditory task was selected so as not to interfere with the acoustic feedback of Vienna set. Data was collected by Vienna set. In order to evaluate the participants’ performance in the acquisition phase, two way analysis of variance (ANOVA) with repeated measure was applied to analyze the data in 3 groups (PEG, DEG, COG). in addition,, repeated measurement was used in order to specify the difference between training blocks and the difference between attentional groups in the acquisition phase. Bonferroni's post-hoc was used at this step. The data was analyzed using one-way ANOVA in order to specify the effect of the independent variable (group) on the dependent variable in the retention phase. Tukey’s post-hoc was used at this step. Total mean duration variable was applied to assess the level of tracking task performance. This is the average time taken to travel the track. With an overview of figure 2, it could be understood that while moving forward through the practice blocks, total mean duration of the tracking task decreased in three groups. Figure 2. Performance score of three groups in the practice and retention phases. Total mean duration variable was applied to assess the level of tracking task performance. This is the average time taken to travel the track. According to the results of repeated measure ANOVA test (Table 1) in the practice phase, the main effect of the practice block was significant F (1.81, 70.75) = 99.449; P < 0.001; partial η = 0.71. Mauchly’s test indicated that the assumption of sphericity was rejected for the main effect in the practice phase (P < 0.001). Therefore, due to the amounts of Epsilon (Greenhouse-Geisser = 0.605, Huynh-Feldt = 0.665), Greenhouse-Geisser was reported as the main effect. The main effect of the group was not significant, F (2.39) = 2.72; P = 0.08, partial η = 0.12. Also, the interaction of groups in trial blocks was not significant, F (3.62, 70.75) = 0.32; P = 0.84, partial η = 0.01. Therefore, in this phase, only a reduction in the total mean duration of the tracking task in three groups was found. The same significant results appeared in Bonferroni's post-hoc, as follows: between block 1 and block 2 (P < 0.001), between block 1 and block 3 (P < 0.001), between block 1 and block 4 (P < 0.001), between block 2 and block 3 (P < 0.001), between block 2 and block 4 (P < 0.001), and between block 3 and block 4 (P = 0.01). Abbreviations: DF; degrees of freedom, F × B; focus × block, MS; mean square, SS; sum of squares, η2p; partial eta squared. In the retention phase (Table 2), the main effect of the group was significant, F (2, 39) = 24.74; P < 0.001. No evidence of a deviation from the homogeneity assumption (P = 0.12) was found. Therefore, Tukey procedure was used to find out group differences. The distal external group (Mean Value = 13.65, S = 2.52) performed more effectively than both the proximal external group (Mean Value = 17.59, S = 2.16) and the control group (Mean Value = 21.06, S = 3.49). Tukey’s post-hoc test with 95% CI showed a significant difference between control group and distal external group (P < 0.01, Mean Difference = 3.47), and between control and proximal external group (P < 0.001, Mean Difference = 7.40). Also, a significant difference appeared between distal external group and proximal external group (P < 0.01, MD = 3.93). Abbreviations: DF; degrees of freedom, F × B; focus × block, MS; mean square, SS; sum of squares. a Dash inserted because data were not reported. The main purpose of the present study was to determine whether or not learning tracking task is affected by different attentional focuses. Generally, it was found out that in each one of the three groups (COG, DEG and PEG), performance of the participants on the tracking task was improved during the acquisition phase compared to pretest. However, no difference was found between different attentional focuses in the practice phase. However, results of the present study demonstrated significant difference between three groups in the retention test, where proximal external group had better performance compared to other groups consistent with some studies (10, 15-17). Bell and Hardy (15) investigated the distance effect on performance of thirty-three expert male golfers. Participants were assigned to one of three attentional focus groups (internal, proximal external, and distal external) and completed five blocks of ten pitch shots, three in neutral conditions and two in anxiety conditions. Results indicated that distal external group had a better performance under both situations. Duke et al. (10) also showed that focus on movement effects and further effects in comparison to closer effects in performing a simple keyboard passage resulted in better performance. It should be noted that in the two mentioned studies, participants were experts, who are expected to portray better learning and performance due to distal external focus. The reason provided by these researchers was the interaction between skill level and better attentional focus, accordingly, distal external focus on experts resulted in better performance. According to the constrained action hypothesis, an external focus of attention enhanced performance and levels of movement automatization (3). For example, Kuhn (18) demonstrated that adopting an external focus enhanced the activity level within M1 reflex (a monosynaptic stretch reflex created on the spinal cord to respond to an undesirable movement and is controlled automatically). Also, according to self-invoking trigger hypothesis, an external focus of attention is advantageous in part, because it prevents self-activation by creating greater “distance” from the self-external focus is located farther from the body, therefore, it should be more effective than the external focus in close proximity to one’s body (11) . This case also points to the fact that more physical distance (from body) facilitates the distinguishing of the movement effect from body (8). Another argument for justification of the above results of present study is using Baddeley's working memory model. According to Baddeley's model, the working memory consists of a visual and auditory channel, and there is a central executive that has the role of a supervisor and connector (19). It seems that in the proximal external group, unlike the other groups, due to the use of specific attentional instructions (consisting of directions up, down, left, and right), the auditory channel was engaged. Therefore, in the retention test and under secondary task condition, the performance decreases due to the auditory channel overload. Therefore, using directions in instructions results in the use of auditory working memory and overload (20). Nevertheless, superiority of distal external group can be related to this case, as well. Generally, in the present study, it was observed that execution under secondary task condition led to increased performance level in three groups. Some studies also observed that execution under secondary task condition can enhance performance levels. For example, Roche et al. (21) discovered that learning one perceptual motor task will be facilitated when accompanying a difficult secondary task. The researchers of this study found that a difficult secondary task causes a positive vigilance which can be useful for performance of the first task of the retention test. Therefore, it seems that difficult secondary task forces a cognitive overload on the learner, which per se causes an increase in the first task encoding. Hemond et al. (22) observed that during practice, performance increases when fingers sequence task is accompanied by a task that is defined as searching for a visual color. Hemond et al. assumed that the reported benefit might be linked to facilitative activities of a continuum neural network (neural facilitation). In other words, a secondary task that involves similar neural pathways prepares neural network for the other upcoming task. Lovden et al. (23) reported that the execution of a secondary mental task with little difficulty rather than none at all, can improve walking performance when walking. These researchers expressed that performing an easy secondary task causes a shift from internal attentional focus to external attentional focus. Researchers of the present study believe that the tracking task was an easy task for the participants, thus resulting in an increase in the performance under the secondary task condition. Huxhold et al. (24) stated that an easy secondary task makes an internal focus shift to external focus on the attentional resources domain, and that the difficulty of the secondary task causes an overload on the attentional resources, resulting in a shift of attention to inside. Generally, researchers of this study argued that, being under easy secondary task condition results in a shift in the attentional focus from inside to outside, increased attentional resources, and finally improved performance. Another reason is that amateur individuals, after some time and practice, progress toward automation and adoption of more external attentional focus. If the task is simple, it makes the process of automation quicker and improves automation quality. When individuals achieve automation or top levels of performance, any task preventing individuals from paying attention to the original action and conscious processing is beneficial (e.g., secondary task). Obviously, in more internal attentional group, due to less automation and more involvement in automatic processing, less benefit will be gained from a secondary task condition. Nevertheless, it seems that the group which has used more external attentional focus in the practice phase (acquisition), will show a better performance because of more automation and the similarity of the practice condition with that executed under secondary task condition (shifting attention to more external). In other words, the external attentional group, as well, somehow received external attentional instructions through the secondary task. Therefore, doing more research with different tasks, variable difficulty levels and different attentional loads is recommended. Furthermore, considering dual task and secondary task conditions in future studies are highly recommended. In this context, visual secondary and motor-cognitive tasks can be adopted to further clarify the other aspects. Also, it is better to use expert participants alongside amateurs in future studies so that the two groups can be compared and the results can be interpreted with more confidence. These findings suggest that increasing the distance of an external focus of attention improves tracking task learning, especially under secondary task, because secondary task condition enhances attention resources and shifts focus of attention to the external environment. Funding/Support: This research did not receive any specific grant from funding agencies. 1. Wulf G, Lauterbach B, Toole T. The learning advantages of an external focus of attention in golf. Res Q Exerc Sport. 1999;70(2):120-6. doi: 10.1080/02701367.1999.10608029. [PubMed: 10380243]. 2. Wulf G, McConnel N, Gartner M, Schwarz A. Enhancing the learning of sport skills through external-focus feedback. J Mot Behav. 2002;34(2):171-82. doi: 10.1080/00222890209601939. [PubMed: 12057890]. 3. Wulf G, McNevin N, Shea CH. The automaticity of complex motor skill learning as a function of attentional focus. Q J Exp Psychol A. 2001;54(4):1143-54. doi: 10.1080/713756012. [PubMed: 11765737]. 4. McNevin NH, Shea CH, Wulf G. Increasing the distance of an external focus of attention enhances learning. Psychol Res. 2003;67(1):22-9. doi: 10.1007/s00426-002-0093-6. [PubMed: 12589447]. 5. Wulf G, Dufek JS. Increased jump height with an external focus due to enhanced lower extremity joint kinetics. J Mot Behav. 2009;41(5):401-9. doi: 10.1080/00222890903228421. [PubMed: 19846388]. 6. Zachry T, Wulf G, Mercer J, Bezodis N. Increased movement accuracy and reduced EMG activity as the result of adopting an external focus of attention. Brain Res Bull. 2005;67(4):304-9. doi: 10.1016/j.brainresbull.2005.06.035. [PubMed: 16182938]. 7. Banks SD. Distal and proximal attentional focus effects on the performance of closed and open continuous motor skills [dissertation]. University of Edinburgh; 2015. 8. McKay B, Wulf G. A distal external focus enhances novice dart throwing performance. Int J Sport Exer P. 2012;10(2):149-56. doi: 10.1080/1612197x.2012.682356. 9. Porter JM, Anton PM, Wu WF. Increasing the distance of an external focus of attention enhances standing long jump performance. J Strength Cond Res. 2012;26(9):2389-93. doi: 10.1519/JSC.0b013e31823f275c. [PubMed: 22067252]. 10. Duke RA, Cash CD, Allen SE. Focus of Attention Affects Performance of Motor Skills in Music. J Res Music Educ. 2011;59(1):44-55. doi: 10.1177/0022429410396093. 11. McKay B, Wulf G, Lewthwaite R, Nordin A. The self: Your own worst enemy? A test of the self-invoking trigger hypothesis. Q J Exp Psychol (Hove). 2015;68(9):1910-9. doi: 10.1080/17470218.2014.997765. [PubMed: 25565349]. 12. Wulf G. Attentional focus and motor learning: A review of 10 years of research. E-j Beweg train. 2007;1:4-14. 13. Schuhfried G. Vienna Test System Psychological Assessment catalog. Austria: Schuhfried; 2012. 14. Schoor C, Bannert M, Brunken R. Role of dual task design when measuring cognitive load during multimedia learning. Educ Tech Res. 2012;60(5):753-68. doi: 10.1007/s11423-012-9251-8. 15. Bell JJ, Hardy J. Effects of Attentional Focus on Skilled Performance in Golf. J Appl Sport Psychol. 2009;21(2):163-77. doi: 10.1080/10413200902795323. 16. Hodges NJ, Franks IM. Learning a Coordination Skill: Interactive Effects of Instruction and Feedback. Res Q Exercise Sport. 2001;72(2):132-42. doi: 10.1080/02701367.2001.10608943. 17. Totsika V, Wulf G. The influence of external and internal foci of attention on transfer to novel situations and skills. Res Q Exerc Sport. 2003;74(2):220-5. doi: 10.1080/02701367.2003.10609084. [PubMed: 12848235]. 18. Kuhn YA. Behavioral adaptations and underlying neural mechanisms in response to different foci of attention [dissertation]. University of Fribourg; 2015. 19. Baddeley AD, Hitch G. Working Memory. Psychol Learn Motiv. 1974;8:47-89. doi: 10.1016/s0079-7421(08)60452-1. 20. Meilinger T, Knauff M, Bulthoff HH. Working memory in wayfinding-a dual task experiment in a virtual city. Cogn Sci. 2008;32(4):755-70. doi: 10.1080/03640210802067004. [PubMed: 21635352]. 21. Roche RAP, Commins S, Agnew F, Cassidy S, Corapi K, Leibbrand S, et al. Concurrent task performance enhances low-level visuomotor learning. Percept Psychophys. 2007;69(4):513-22. doi: 10.3758/bf03193908. 22. Hemond C, Brown RM, Robertson EM. A Distraction Can Impair or Enhance Motor Performance. J Neurosci. 2010;30(2):650-4. doi: 10.1523/jneurosci.4592-09.2010. 23. Lovden M, Schaefer S, Pohlmeyer AE, Lindenberger U. Walking variability and working-memory load in aging: a dual-process account relating cognitive control to motor control performance. J Gerontol B Psychol Sci Soc Sci. 2008;63(3):P121-8. [PubMed: 18559676]. 24. Huxhold O, Li SC, Schmiedek F, Lindenberger U. Dual-tasking postural control: aging and the effects of cognitive demand in conjunction with focus of attention. Brain Res Bull. 2006;69(3):294-305. doi: 10.1016/j.brainresbull.2006.01.002. [PubMed: 16564425].